Let’s face it, no one really likes to house clean, especially after a long day at work. Trying to teach your kids how to house clean when you don’t like house cleaning can be challenging. However, kids need to learn to pick up after themselves as well as how to keep a sanitary living space that is fitting for others. White Glove Cleaning in Spokane Valley offers the following tips to help teach kids how to clean. Start early. Making house cleaning something you do every day similar to eating and drinking from an early age will make house cleaning seem like something that is expected to do. As soon as kids can pick up their toys, they should be required to do so. As kids age, adding more and more responsibilities to their plates will make house cleaning a normal part of life. Make it fun. Turn house cleaning into a game. Set a timer and try to beat the timer. Make house cleaning a friendly competition by seeing which family member can get their house cleaning chores done the fastest. Make it educational. Count legos while your child picks them up. Identify the shape of objects they are picking up, as well as what color the item is. Pick out letters on books you pick up off the floor. Play music. Music distracts your mind and makes the time go by faster. You can also make up your own silly songs and have a contest on who can make up the best silly song while house cleaning. Resist doing it for your child. 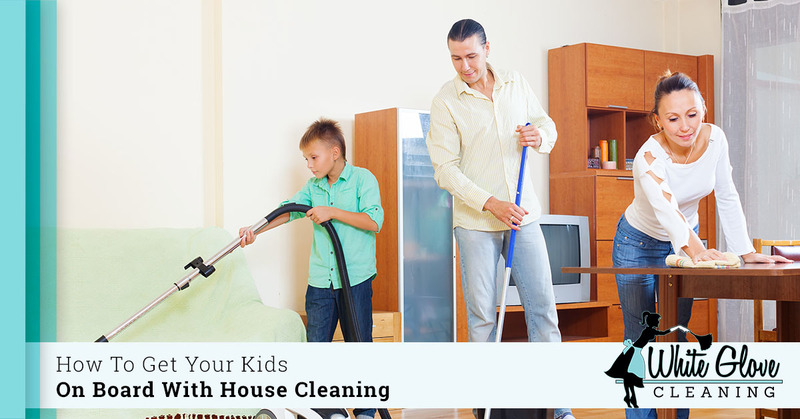 We all know you, as a parent, can house clean faster and more thorough than your child. However, if you clean for your child, he or she will learn that he or she won’t have to clean because eventually you will do it, and he or she won’t learn the process of cleaning. Furthermore, don’t “fix” the cleaning service your child just completed. Your child will just learn he or she doesn’t have to try very hard because mommy or daddy will fix it for them. Reward system. Never underestimate the power of a sticker for getting your child to do tasks. Once the house cleaning is done, reward your child with a sticker for a job well done, or, if your child is older, with a treat from his or her favorite place. Reward systems are extrinsic motivators that can be converted into intrinsic rewards later on once the habit is established. White Glove Cleaning in Spokane Valley specializes in house cleaning services as well as commercial cleaning services. We offer apartment cleaning and move-in and move-out cleaning services as well. Our website lists all of what is included in a standard house cleaning and commercial cleaning job as well as optional add-ons when needed. White Glove Cleaning understands the frustrations a parent may feel when trying to teach his or her child how to clean. We hope these tips have been valuable, and if you feel you need to begin a professional cleaning service or just need a one-time spruce up, give our professional cleaning service a call today!